Our last week of excavation at SAV1 East for the field season 2014 has just started – and so far we are very happy with the results (not with the nimiti attacks which are back to their usual force for the month February…)! 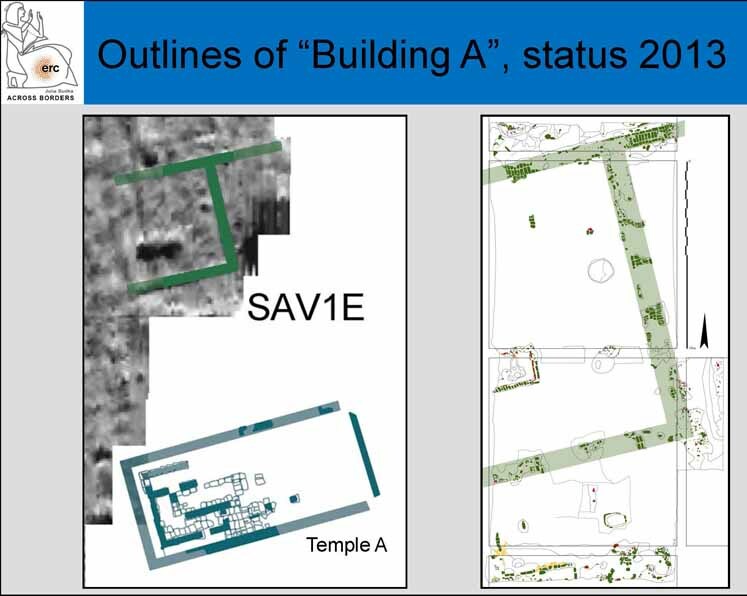 All in all, exactly like last year, we managed to trace the anomalies visible on the geophysical survey map from 2011: Our Building A is growing in size, it is getting more and more comparable to the so-called governor’s residence SAF2 in the southern part of the town. Outlines of Building A in its eastern part, status of 2013. As we were hoping, the further westwards we moved within the site SAV1 East, the higher the deposit gets! Thus, other then last year with our “negative walls”, we were able to find and document some remains of the foundations of substantial mud brick walls, as well as nice remains of a mud pavement between two parallel walls. The western extension of SAV1 East, with mud pavement between two new North-South walls. 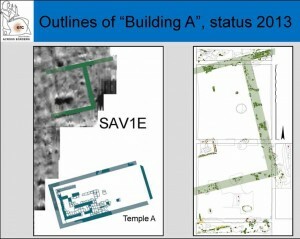 The 2014 season seems to have confirmed the alignment of Building A along the main North-South street, thus being exactly in line with Temple A and also the governor’s residence SAF2. The entrance area is located in the western part, where the structure was accessible from the street. Very striking are remains of a schist-pavement in the newly found entrance rooms at the western side of the building. Unfortunately, the pavement has been badly destroyed in ancient times, but we are positive that we will be able to reconstruct the former area covered by schist according to the clusters of broken fragments. 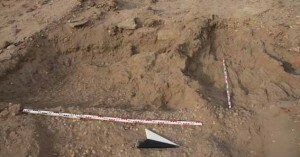 Disturbed area in the western part of Building A; note the schist fragments, once part of a pavement and dislocated during the destruction phase. During this week, we will focus again on these entrance rooms and hope to get further stratigraphical information confirming our present dating of Building A to Thutmoside (mid 18th Dynasty) times. 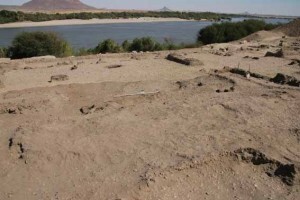 This entry was posted in 18th Dynasty, Archaeology, Fieldwork, Sai Island, Upper Nubia and tagged Sai Island, SAV1 East by Julia Budka. Bookmark the permalink. It is very nice reading about these great results in SAV1 East! Looking forward to get more information in the next posts! Many greetings to all of you from Vienna!